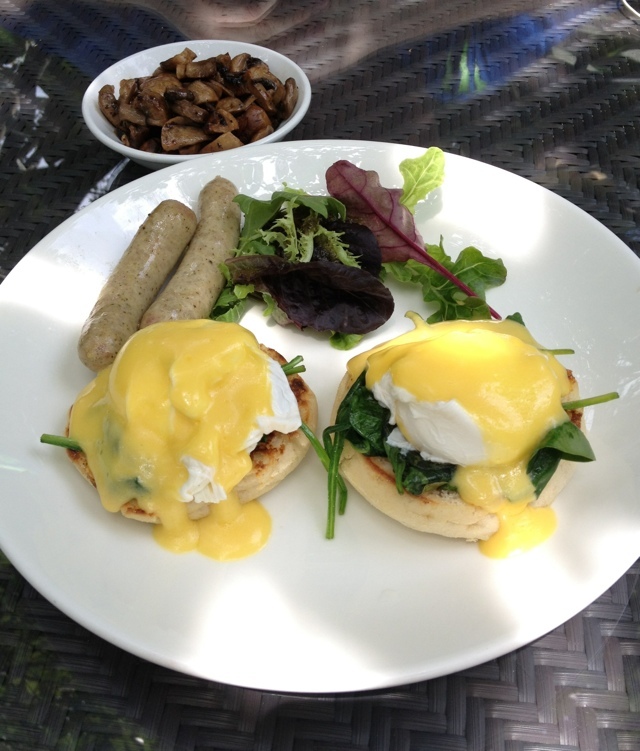 There is a little gem which sits in the lush greenery and annoying rattle of the construction site at Bishan Park – where we had a pretty pleasant alfresco brunch at The Canopy. Two of us had the egg royalés ($12), they were surprisingly good. We had to wait a while for it, but the eggs didn’t disappoint- they spilled golden runny yolk at the gentle poke of the fork. 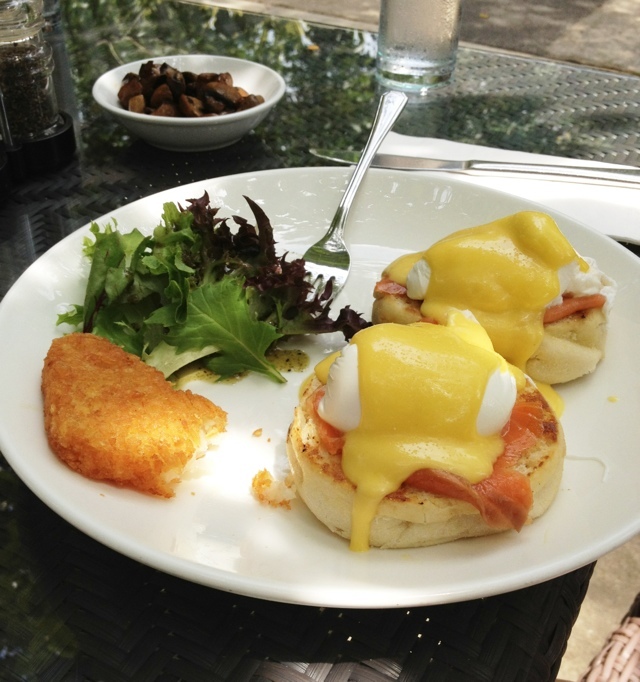 It was a mouthful of delight – the melted cheese, salmon and hollandaise sauce. Even the muffins were fresh! The sautéed spinach from the egg florentine was well cooked too. If you want to give yourself a treat on a weekend and fill up your plate just a little more, you have the option of adding sides. They have a pretty good list to choose from. We had sautéed mushrooms, hash brown and sausages. 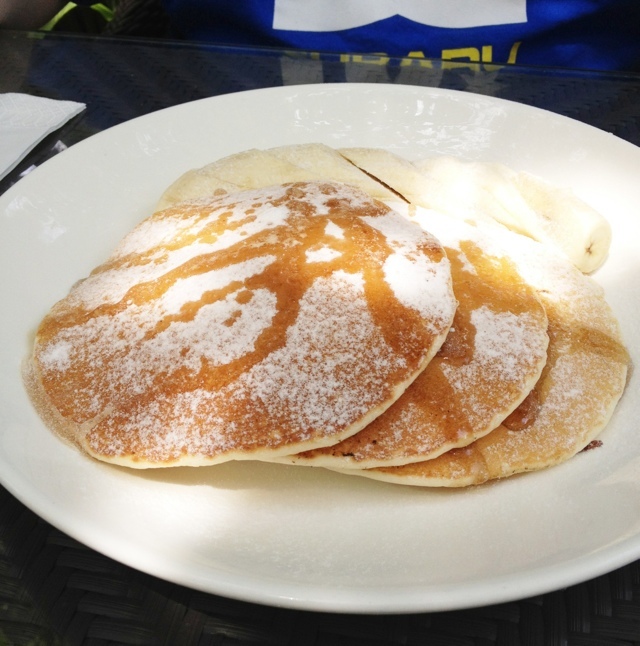 The plain-looking pancakes were fluffy but it tasted quite one dimensional with the banana. Think strawberries and apricots still work with pancakes better 😉 The fruit juice was $10 but it tasted no different from what you’d get for $2 at a local hawker centre. It is a place to chill out, so don’t expect tip top service. The staff are crowded indoors where the air-conditioning is, and it may take some frantic waving before you get their attention. This entry was posted in Food, Fun and tagged brunch, food, happy, photography, singapore, weekend, yummy by lifestartsonfriday. Bookmark the permalink.